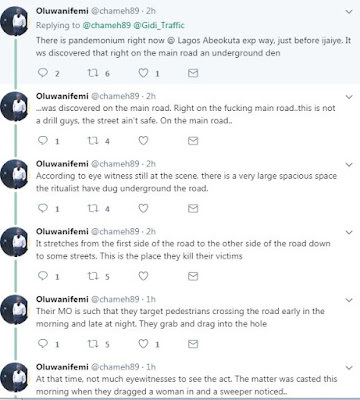 This underground ritualist den was uncovered at Obadeyi bus-stop, Ijaiye, Lagos-Abeokuta road, was uncovered by those who came to the aid of a sweeper who was heard screaming for help after she was abducted. 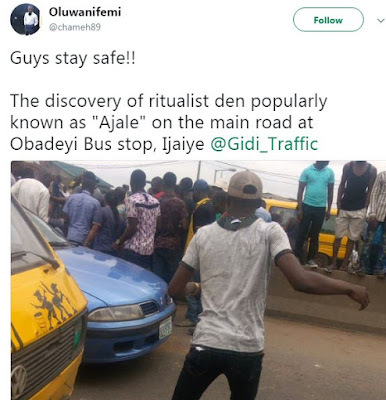 A Twitter user who was also a witness, Oluwanifemi further disclosed that the ritualists allegedly target pedestrians who ply the road early in the morning and late at night. Their victims are dragged into the hole which stretches along the whole road where they are eventually killed. 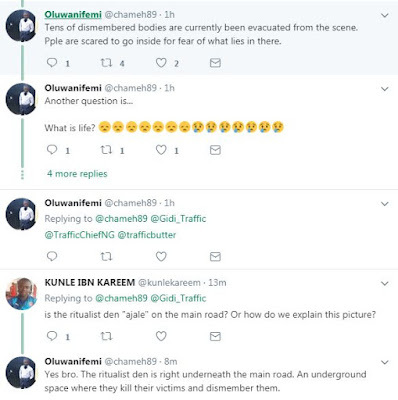 God has exposed them o, what an evil world. Who knows how many people they've killed o... God will pay for them all.